I made it with construction paper, fleece material, carve-able foam, lots of hot glue and spray glue. The top was made with a plastic bowl that I glued the red furry hair material onto. The eyes are foam balls that I filled, sanded and painted. I can see through some screen material that I covered the inside of the mouth with. As a final touch I carried around a flask with “water” and dry ice that I could drink through my bendy straw. Thanks for checking out my costume. I had fun making it and I hope you enjoy it too. 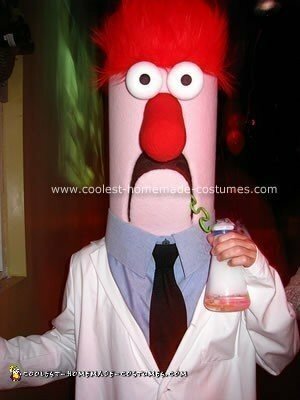 Dude…first off…Awesome costume! Where did you get the Red Furry Hair from? I’m attempting to make this costume and can’t seem to find anything good yet. Also, what did you use for the nose? Please help!! Where do you find the big collar shirt? Wrapped construction paper around a plastic bowl for the top of the head, and hot glued them together. Wrapped this with thin, 1/4″ foam and then fleece material. With hole cut for the mouth, stretched the fleece material around the edges and hot glued it to the inside. The nose was sculpted out of craft foam (hard light sandable) and wrapped with fleece. The hair was made from several layers of furry material I found at the fabric store. The shirt was hand made. I used a construction paper liner to help keep the collar firm. I only made the top half of the shirt, just enough to go below the lab coat. The tie was also hand made from black fabric because store bought tie would not be long enough. Where on earth did you find hair like that?? Ive been looking everywhere for a material similar to that!! Amazing costume. I’m stealing your idea this year (if I can find all the materials). Quick question – You say you “filled” the foam balls. What do you mean? Filled, Meaning he put a coat of filler around the foam and sanded it down to give the eyes a smooth look. great Job. The best costume i have seen.